Original 11x14-inch lobby card for "O'Malley of the Mounted" starring William S. Hart. Buff-colored card stock. Pinholes show it hung on the wall of a theater. Written and produced by Hart; Directed by Lambert Hillyer. According to the Internet Movie Database, the film was shot in Chatsworth. Production apparently wrapped Dec. 20, 1920; it was released Feb. 6, 1921. Theatrical release by Artcraft; distributed by Paramount Pictures Corp. Both companies were subsidiaries of Famous Players-Lasky, whose name appears on this lobby card at lower right. "O'Malley" was probably the last film released under the Artcraft name. Later that same year (1921), the Federal Trade Commission sued Famous Players-Lasky as the FTC started to crack down on block booking, where production companies owned so many movie theaters, they were able to force independent theaters to pay for "blocks" of films, including lousy ones, sight-unseen, if they wanted to show the good ones. The government considered Famous Players-Lasky the "largest concern in the motion picture industry and the biggest theater owner in the world" and charged it and 11 others with "conspiracy and restraint of trade" in violation of anti-trust laws. Finally on July 9, 1927, the FTC ordered Famous Players-Lasky to end the practice of block booking. But Famous Players-Lasky (as Paramount) delayed and fought back for another 20 years. The end came in 1948 when the U.S. Supreme Court (in United States v. Paramount Pictures Inc.) outlawed block booking and demanded a separation of theater ownership from production and distribution. Getting back to "O'Malley of the Mounted," it's not the bad-guy-goes-good fare of the typical Hart film. It's a bit more like a John Wayne-Lone Star Western of the 1930s where the protagonist is a good guy who infiltrates a gang by pretending to be a bad guy. The difference is that here, instead of falling for a virtuous girl like Hart or Wayne usually do, Hart falls for the sister of a bad guy. In a twist, Hart ultimately turns in his badge rather than hand over the girl's brother, whose crime Hart (as O'Malley) considers justified. That's what's behind the tag line on this lobby card: "I'm going to resign from the service — I can't arrest the brother of the woman I love." In the end, lust conquers all. 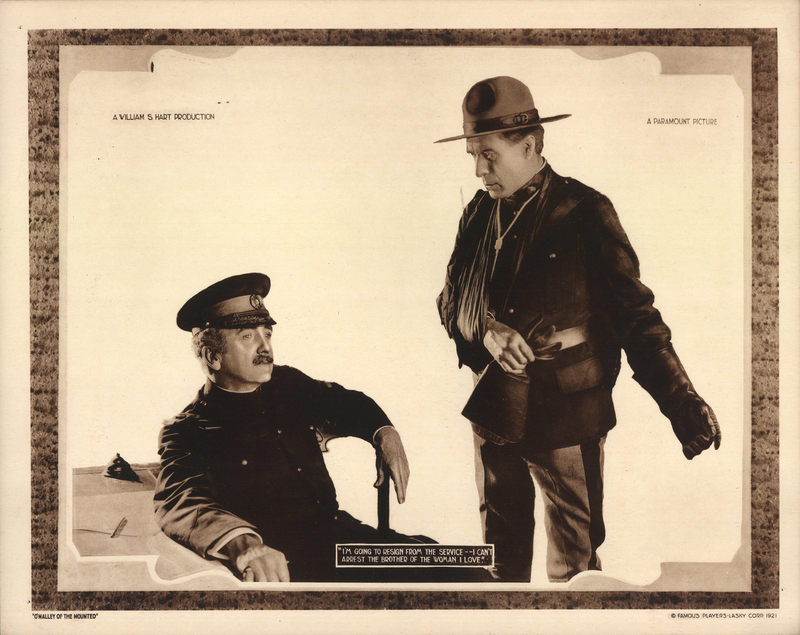 About "O'Malley of the Mounted"
LW2578: 19200 dpi jpeg from original lobby card purchased 2014 by Leon Worden.